Seven Russian female athletes have all received two-year doping bans for manipulating drug samples. 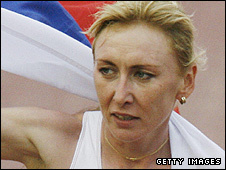 The group included double world 1,500 metres champion Tatyana Tomashova. As well as Tomashova, world indoor 1,500m champion Yelena Soboleva, distance duo Yuliya Fomenko and Svetlana Cherkasova were also banned. The others were European discus champion Darya Pishchalnikova, hammer thrower Gulfia Khanafeyeva and former 5,000m champion Olga Yegorova. "The seven women were found guilty and thus were banned for two years," Russian athletics federation president Valentin Balakhnichyov said. The IAAF said their drug samples taken in out-of-competition tests in May 2007 and then at last year's world championships in Osaka did not match. "We had undeniable proof of the athletes tampering with doping control process. The DNA in their samples just did not match," Balakhnichyov added. "We could have banned them right then but first we had to give the athletes the chance to defend themselves," he said. "In every respect, they could not provide an adequate proof of their innocence, thus we had no choice but to ban them for two years which is a minimum sentence in this case." All but Yegorova have now retired from the sport with Tomashova planning to appeal. "I don't consider myself guilty," Tomashova said. "As far as I know other girls are also planning to fight the ban in court."